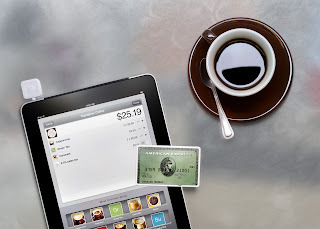 Square (mentioned on this blog in 2010) came out with a big announcement this week to digitize our credit cards and loyalty cards with a iPad-based Register for the retailer and a Card Case mobile wallet on your smartphone. It's potentially very disruptive to credit cards. It's also billed as a cash register / credit card terminal killer. This comes on the heels of Visa's strategic investment in Square last month. The big story here, however, is about the underlying transaction data and its value to the Square model. As Square explains: "Know Your Business. Know how many cappuccinos you sell each day. Download full reports that give you insight into your sales patterns and inventory." It's early days but Square's genius is in its simplicity - at locations using the Square Register software on an iPad, you only have to use your credit card once to activate your payment information in your Card Case. Then, in the future, you theoretically don't have to bring your phone with you as long as you've already been a customer at the retail location. No need here for NFC so you can wave your phone (Google NFC rumour) near a payment terminal. With Square Register, sellers can automatically generate and send digital receipts to customers, enabling them to track and store their purchase history right on their phone. 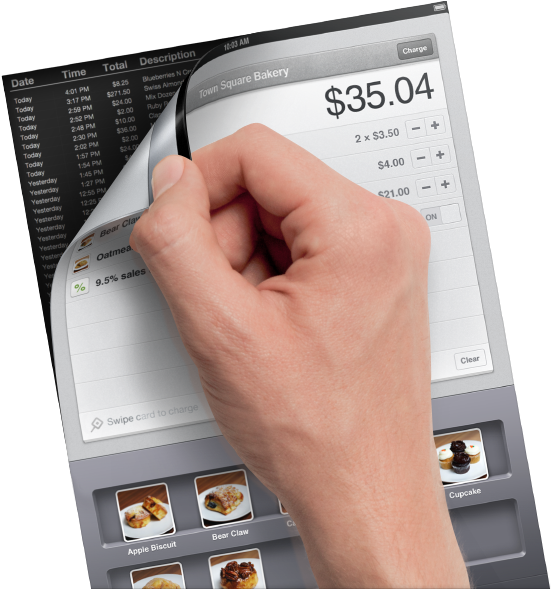 This eliminates the need for costly, wasteful paper receipts. Card Case, a feature of the Square app for iPhone and Android, enables customers to access Directory and Menus, and open Tabs at their favorite merchants, making purchasing instant and effortless. Card Case can be activated through a text message invitation from Square after making a credit card purchase at a participating merchant. Similar to one-click purchases made popular by online retailers, Tabs make payments instant and effortless in the real world. Once a customer opens a tab on their phone, sellers can verify a customerʼs identity with a stored profile and photo on Square Register and approve their purchase with just one touch. Tabs eliminate the need for cash or credit cards at checkout, enabling customers to leave their wallets at home. When you register: we collect your name, location, phone number, email address and other related information. When we verify your identity and underwrite your application for an account: we will request additional personal information to confirm your identity and manage our risk. We may ask you for your driver’s license number, social security number, birth date or other personal information. At times we will obtain information about you from third party verification services and credit bureaus. The plan could be far reaching. Just imagine what Square can eventually do with all this transaction data. Not only does it serve it up to the retailer, but it can potentially start delivering Groupon-like deals to you, the consumer, through it's Card Case app. As Square focuses on smaller retailers first, it can arguably be following Christensen's disruptive innovation process, taking root initially in simple applications at the bottom of a market and then relentlessly moving ‘up market’, eventually displacing established competitors. Square is perfectly aligned with the trends in data mining. 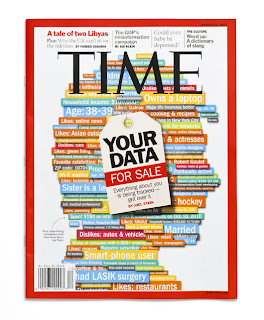 Recall Joel Stein's Time Magazine article in March 2011 "Data Mining: How Companies Now Know Everything About You"
"In the past few months, I have been told many more-interesting facts about myself than my Social Security number. 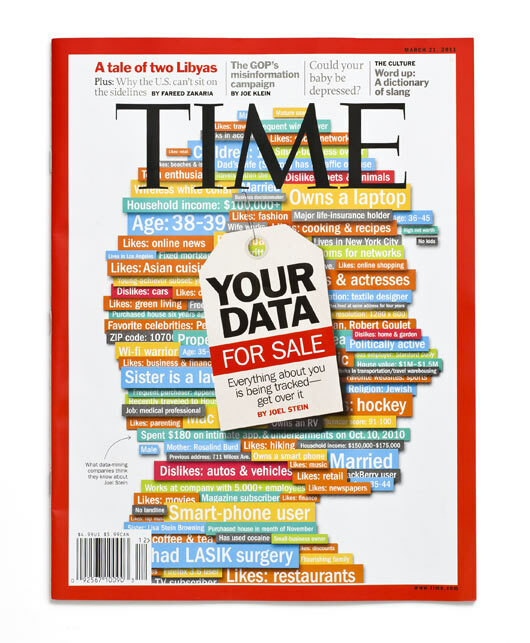 I've gathered a bit of the vast amount of data that's being collected both online and off by companies in stealth — taken from the websites I look at, the stuff I buy, my Facebook photos, my warranty cards, my customer-reward cards, the songs I listen to online, surveys I was guilted into filling out and magazines I subscribe to." 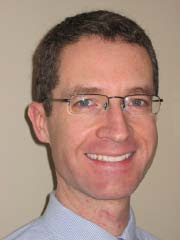 "Big data will help to create new growth opportunities and entirely new categories of companies. Many of these will be companies that sit in the middle of large information flows where data about products and services, buyers and suppliers, consumer preferences and intent can be captured and analyzed." Square (and Visa) has made a clear statement that the data arms race is on.